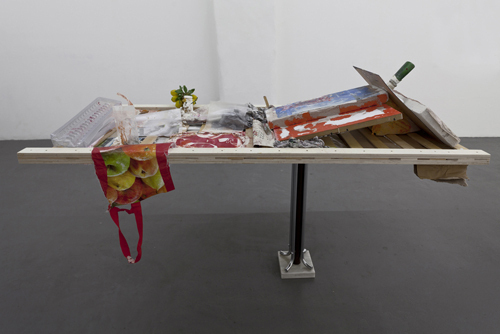 Henrik Olai Kaarstein, Catch, Fall, Tonight, 2012, mixed media on wooden bed base and stand, dimensions variable. Henrik Olai Kaarstein, a student at the Staatliche Hochschule für Bildende Künste in Frankfurt, spent the summer of 2010 organizing the houses of several people who had died, emptying out the dwellings and arranging their contents in large containers. While doing this he was struck by the aesthetic and semantic value of the women’s possessions, particularly those made of fabric (towels, sheets, rugs, tablecloths, curtains, and traditional Norwegian quilts, both antique and modern), which he felt were able to preserve the memory of the former owners and bear witness to their stories. Inspired by this experience, he became fascinated by the similar fabric items available in more public contexts: hotels, bars, saunas, and the likeexpropriating these items, thereby removing them from their traditional fate. To do so, he spent time at their source sites, for example, mingling with other hotel guests in order to better absorb the establishment’s atmosphere and to understand its dynamics. The result of this research is a series of compositions halfway between painting and sculpture, fourteen of which form the focal point of his current exhibition at T293 gallery—his solo debut in Italy. The works are arranged along walls or mounted on stands, where the elements he collected from those businesses are added to others—slippers, scraps of papers, and bars of soap—found in friends’ houses or in the trash. His elaborate arrangements hinge on the concept of memory and how it can be transmitted through the simple traces of daily life. Echoes of New Dada and Nouveau Réalisme reverberate in the exhibited works, as they do in Kaarstein’s research more generally. He is constantly engaged in visually and conceptually regenerating the objects of his interest, and the title of this show, “Turning and Returning,” underscores this approach well.